+TYLT has some really wicked stuff. Both Martin and I have covered several of their accessories in the past and loved how well built they are. Not to be left out of the mass marketing of the behemoth that Black Friday is, they're having a 50% off all items in stock. Now 50% is a deal. I need a new car charger, and a few good charging cables too. Heck for that price maybe a battery pack as well. 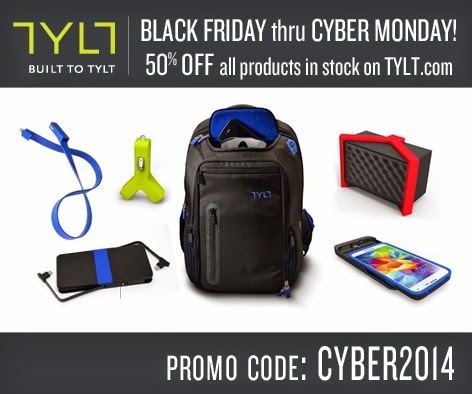 I wanted to let you know that TYLT will be offering 50% ALL products in stock at www.TYLT.com from Friday 11/28 through Monday 12/1 for Black Friday and Cyber Monday. This is an amazing deal for holiday shoppers and includes popular items like the Energi+ Backpack (normally $200 / now $100), Energi Sliding Power Case (normally $100 / now $50) and TUNZ Bluetooth Speaker (normally $150 / now $75). To make the deal even better, TYLT is offering free shipping to all customers in the continental United States via USPS first-class mail. Simply enter promo code ‘CYBER2014’ at checkout. So we don't get the free shipping, but still some great deals. Go check out the deals on Friday throughout the weekend.